THY Fokker F27 Friendship landing at Athens Hellenikon Airport in 1973. THY Douglas DC-10 in 1974 wearing the airline's initial colour scheme. 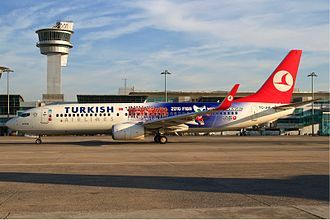 A Turkish Airlines Boeing 737-800 in 2010 FIBA World Championship livery at Istanbul Atatürk Airport. Istanbul Atatürk Airport, November 2013.